Jean-Pierre Jeunet hasn’t done a great deal since his masterpiece Amélie [review here] in 2001. There was A Very Long Engagement in 2004, but that was a bit of a departure in tone; more serious and romantic than whimsical and fantastic. 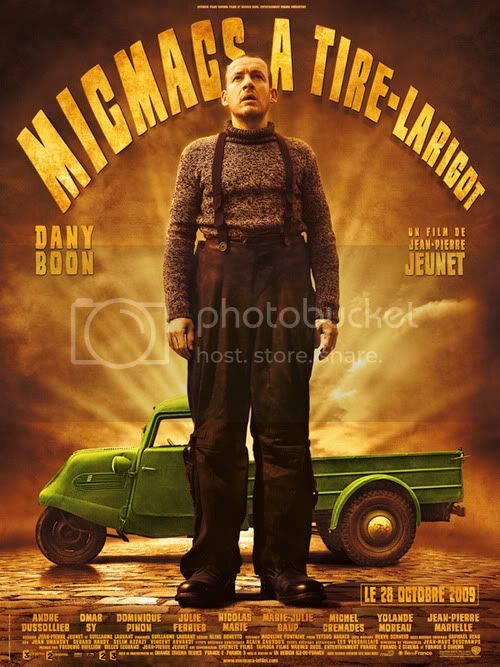 Now, with Micmacs, Jeunet is back to his old form, proving once again that his attention to detail and visual aesthetic have virtually no peers in cinema today. Before the opening credits a man dies courtesy of a landmine. He’s a Frenchman, surveying some ground that has been littered with deadly ordinance. His family takes the news rather badly, but these somber scenes are filled with Jeunet’s touch of the absurd and the morbidly skewed, reminiscent of Amélie’s suicidal goldfish. This man’s son grows up with a set of problems, told in rapid montage, Jeunet-style. Eventually the kid is a grown-up layabout, working in a video store squeezing cheese into his mouth as he pantomimes old Humphrey Bogart movies. But one night a car comes careening down the video store’s street, followed closely by a motorcycle carrying a couple armed men. A shootout ensues, during which Bazil (Dany Boon) is accidentally hit with a bullet in the brain. After all this exposition the opening credits finally roll, followed by doctors set with an important decision: to operate on Bazil and risk him living as a vegetable, or letting him pass peacefully. A coin toss is chosen to determine his fate. There would be no movie if the coin came up the wrong way, so it’s no spoiler to say that Bazil survives the operation. But now he’s homeless (his landlady figured he was dead, or as good as dead) and jobless (his boss hired a young lady with more cleavage than Bazil could muster). So he finds himself wandering the streets; much of these scenes, and other sections of the film, play out like classic silent films, with Boon successfully pulling off acts similar to the works of Keaton, Chaplin, or Lloyd. Eventually a fellow street-worker named Placard (Jean-Pierre Marielle) befriends him and takes him to an orphanage for street vagrants. The main difference is that all of them deal with salvaged goods, which they rework into usable equipment. Presiding over them is Tambouille (Yolande Moreau, another Amélie alum). She mothers the lot of them, including La Môme Caoutchouc (Julie Ferrier), a contortionist; Fracasse (Dominique Pinon, a familiar Jeunet standby), a daredevil of sorts who’s proud of the various foreign objects in his body; Remington (Omay Sy), a mentally unbalanced man who speaks almost solely in idioms and phrases; Petit Pierre (Michel Crémadès), a mechanical artist with a surprising amount of strength for someone with such a small stature; and Calculette (Marie-Julie Baup), whose father was a surveyor and whose mother was a seamstress, leaving her with an impeccable sense of calculation and estimation. Once the odd gang has been introduced the main story is allowed to get underway. Bazil has long known the name of the corporation whose landmine killed his father, and after his own shooting he discovers the manufacturer of the near-fatal bullet. By chance he happens across the respective companies, whose offices are across the street from one another. After some initial infiltration and surveillance, aided by his mixture of salvaged materials, he decides to pit Monsieur Fenouillet (Andre Dussollier) against his business rival, Monsieur Marconi (Nicolas Marie). With the help of his new friends, Bazil soon manages to set the two companies, and their leaders, against one another, with the misuse of a recently displaced African dictator and his friends’ numerous inventions and abilities. The story is quirky and different, and manages to wander less than Amélie’s overall plot. But where Amélie benefited from not being tied to any particular story, Micmacs feels more solidly grounded because of it. Bazil is a strong central character, and is supported by a strongly defined set of folks who could almost be called a circus side show. Each of their characteristics comes in handy as they mount an ever-escalating campaign against the arms manufacturers. Much of this feels like an extension and expansion of Amelie’s various mischiefs against the grocer (Urbain Cancelier, who has a rather funny role as Monsieur Marconi’s security guard here). Much of what transpires does so merely because Jeunet thought it up; his imagination is nearly endless, and always entertaining. His unique visual style is also back. Every scene is packed with an exorbitant amount of detail. The city is yellow in the exterior shots, and gray and industrial inside buildings, but the color is again so over-saturated that there are constant reminders of bright, vibrant color in just about every scene. At times Micmacs looks and feels more like Jeunet’s earlier collaborations with Marc Caro, such as Delicatessen and The City of Lost Children. There is more whimsy here, though, and more fancy, and this is what makes Micmacs so thoroughly enjoyable. There aren’t many great and important themes to pull from Micmacs, though a final scene with the weapons dealers carries some evocative images. This, however, almost feels a bit tacked on, even though Bazil’s journey through the film makes it clear that the arms manufacturers’ jobs have a very personal impact on a lot of people. I’m not sure the film is meant to enlighten or provoke deeper thought; it looks and sounds like pure, detailed, imaginative entertainment, and it succeeds at this admirably. This entry was posted in 3.5 pirate flags, 3.5 stars, M, Movie Reviews, Pirate Flag Rating, Star Rating on July 13, 2010 by Tim Irwin. I would really like to see this movie. I saw Amelie for the first time recently, and I loved it. I have a feeling I would love this movie as well.